William Alfred Delamotte (or de la Motte) senior was a famous landscape artist, and a full account of his life and works can be found in the Oxford Dictionary of National Biography. The information below focuses on his time in Oxford, and also gives a biography of his son, also called William Alfred Delamotte, who is sometimes confused with his more famous father. He was also an artist, and drew many scenes of Oxford. There is also basic information about some of his other children: three of his other sons were artists or engravers. William's father Peter Delamotte was a bookseller and jeweller. His mother Sarah Cotes was the daughter of Digby Cotes, the Rector of Abbey Dore in Herefordshire. William's parents were married in Hereford on 7 November 1774. In April 1772 William’s father Peter Delamotte bought from Dr Simon Glass (a surgeon of the University of Oxford matriculated as a privileged person on 16 May 1752) his “Art or Secret of making or preparing Magnesia”, and succeeded to Glass’s house at 33 High Street, Oxford as well as to the lease of the farmhouse at Bartlemas in Cowley where the magnesia was made. Laetitia Delamotte (born in Weymouth in 1802/3). William's brother Peter Delamotte wrote a guide to Weymouth in 1783. From 1784 the family appears to have spent more time in Oxford. On 8 December 1784 William’s parents Peter & Sarah Delamotte took the seven children born after William to St Aldate’s Church in Oxford: their second child, Philip, who was already half baptised was received into the congregation, while the next six were baptised together. By the time of Amelia's birth in 1787, the family appears to have been living near Carfax in St Martin's parish. Last week was married, at Weymouth, the Rev. William Burgess, Rector of Upway, in the county of Dorset, to Miss Sarah Delamotte, eldest daughter of Mr. P. Delamotte, of St. Bartholomew's, near this city. Lately died, on board the Victorieux, in the Mediterranean, aged twenty-four, Lieut. Philip Delamotte, second son of Mr. Peter Delamotte, of this place; a youth, whose promising qualifications have rendered his loss (irreparable to his parents and relatives) most sincerely and deservedly regretted by his shipmates, his friends, and acquaintance. On 23 July 1813 William's brother Charles Delamotte, described as a surgeon of Oxford although he was only aged 18, signed up for military service in Canada. William Alfred Delamotte senior was born at Weymouth on 2 August 1775, the eldest son of Peter Delamotte and Sarah Cotes (see above). He exhibited at the Royal Academy in 1793, when he was 18, and entered the Royal Academy Schools in 1794. The first references in Jackson’s Oxford Journal to William Delamotte senior is on 21 October 1797 when he was aged 22: he was then advertising a print he had drawn of Christ Church Great Gate, Oxford, adding: “Subscriptions received by the Proprietor, Mr. William Delamotte, Oxford, where the Print may be had”. In 1798 he briefly took over J. B. Malchair’s practice as a drawing-master, and restored the Streater ceiling decoration in the Sheldonian Theatre. William appears to have been based in St Aldate’s, as this was given as his address in an advertisement for his sketches from nature on 13 February 1802. On 27 August 1803 “Mr. Wm. Delamotte” appears in a list of Ensigns in the election of Subaltern Officers for the Regiment of Oxford Loyal Volunteers. In that same year he was appointed an assistant drawing-master at the Royal Military College (first at Marlow, then from 1812 at Sandhurst). His future wife Mary Anne Gage was the daughter of Thomas Gage and Isabella and wwas born in Chipping Norton and baptised there (as Marian Gage) on 19 July 1786. Geraldine Delamotte (born at Sandhurst in 1826/7). Their eldest son, William Alfred Delamotte junior (also sometimes known as Alfred William Delamotte), was also an artist and is often confused with his father: see below. Two of William Delamotte senior’s siblings were probably still in Oxford in the 1830s. In 1834 his brother George Delamotte, described as a former professor at the Royal Military College, was adverting drawing and painting lessons at his residence at the mercer William Ringrose’s house in St Aldate’s Street; but by 1841 he was in Farnham, and by 1851 in Greenwich. His sister Letitia is likely to be the L. Delamotte, grocer & tea dealer, listed at 82 High Street, Oxford in Robson’s Commercial Directory for 1839; but by the time of the 1851 census she was the housekeeper of her artist brother Thomas at 5 Geneva Cottages, Edmonton, North London, and she died in Hertfordshire in 1860 (death registered Ware district in the third quarter). The 1841 census shows William Alfred Delamotte senior living at the Royal Military College at Farnham with his wife and four of their children (Louisa, Edward, Philip, and Geraldine). On 15 August 1850 at St Anne's Church, Soho, Louisa Delamotte of that parish married William Mayo of St Mary's parish, Islington. At the time of the 1851 census William Delamotte (now 73 and retired) was visiting Thomas Apreece Soley, a general practitioner, at Thames Street, New Windsor, while his wife Mary (66) was a visitor at the Oxford home of her married daughter Geraldine Parsons (The Lawn in St Giles’s Fields, on the Banbury Road). By the time of the 1861 census both William Delamotte (85) and Mary Ann (76) were “lodgers” in that mansion with the Parsons family, and they both stayed there for the rest of their lives. † William Delamotte senior died at The Lawn at the age of 88 on 13 March 1863 and was buried at St Sepulchre’s Cemetery on 18 March (burial recorded in the parish register of St Giles’s Church). DIED. March 13, at the residence of his daughter, “The Lawn,” St. Giles’s Fields, near Oxford, William De la Motte, Esq., late of the Royal Military College, Sandhurst, aged 88. His wealth at death was nearly £2,000. † Mrs Mary Ann Delamotte, the wife of William Delamotte senior, died at the age of 84 on 19 November 1868 and was buried at St Sepulchre’s with her husband on 25 November (burial recorded in the parish register of St Giles’s Church). William Alfred Delamotte junior (sometimes also known as Alfred William Delamotte) is often confused with his father. He is not buried in St Sepulchre’s Cemetery. William junior was born at Bartlemas, Oxford and baptised at Great Marlow on 8 September 1806. In the early 1830s William Alfred Delamotte junior did many of the drawings for James Ingram’s Memorials of Oxford (published in three volumes between 1832 and 1836). These were then engraved by the Headington wood engraver Orlando Jewitt. In 1839 he appears to have been living in St Clement’s, Oxford, as Robson’s Commercial Directory for that year lists W. A. Delamotte as an artist at 5 St Clement’s Street. Jessie Clementine Delamotte (born in London in 1846, registered West London fourth quarter). At the time of the 1851 census William Alfred Delamotte junior was the Librarian at St Bartholomew’s Hospital and living at 51 Hanover Street, Finsbury with his wife Jemima (36) and his daughters Jemima (5) and Jessie (4). In the following decade he fell on hard times, and in 1861 his daughter Jemima Fitz Geraldine Delamotte (16) was working as a domestic servant at 46 Minto Street, Midlothian and claiming to have been born in France. She was married in Kent in the first quarter of 1871 (North Aylesford registration district) to James Pope. At the time of the 1871 census, shortly after his daughter Jemima’s marriage, William Alfred Delamotte junior was an inmate of the West London Union Workhouse at Upper Holloway; and his younger daughter Jessie Delamotte (24) was also in service in Midlothian, working as a lady’s maid. William Alfred Delamotte junior died in London on 19 September 1872 when he was about 66 (death registered Islington district with age wrongly recorded as 81), and his wife Jemima died in London eight years later at the age of 69 (death registered St Giles, London first quarter of 1880). Their daughter Mrs Jemima Fitz Geraldine Pope also fell on hard times. By the time of the 1891 census she was a widowed needlewoman (still claiming to have been born in France) living at the Union Workhouse in Gun Lane, Stroud. Freeman Gage Delamotte (born 1813/14) was an artist and wood-engraver who published several works on alphabets and illumination. He and his wife Louisa Stokes were living at 53 Devonshire Street, Holborn in 1851 with their children Freeman (6), Louisa Geraldine (5), and Rosa (1). His first wife Louisa died in 1854, and in 1855 he married his second wife Caroline Westlake (1829/30–1886), in West London, and the 1861 census shows them living at 15 Herbert’s Place, Westminster with Louisa and Rosa from his first marriage, and Gage (2) and Laura (nine months) from his second marriage. He died on 16 July 1862 at the age of 48 at 15 Beaufort Buildings, Strand, Middlesex, His wealth at death was under £100 (probate, 7 August 1862), and his widow Caroline was his executor. Edward Delamotte (born 1817/18) was a teacher of landscape drawing who took over his father’s post at the Royal Military College, Farnham. He and his first wife Anna Sophia Marillier had two children in Farnham: a daughter, Annie Sophia Delamotte, born in 1847, and a son William Edward Delamotte, born in 1849. His wife Anna died at Farnham in 1850, and the following year the census shows Edward living with his one-year-old son William Edward Delamotte and two servants at the Royal Military College. On 6 December 1853 at St Giles’ Church, Oxford, Edward Delamotte married his second wife Katherine Hester, daughter of George Parsons Hester, the Town Clerk of Oxford. They do not appear to have had any children, and at the time of the 1861 census they were living at the Royal Military College with Edward’s son from his first marriage. By 1871 Edward was the drawing master at Harrow School, and they were living at London Hill, Harrow. In 1891 his daughter Annie Sophia Delamotte (43) was working as a housekeeper at the Junior United Service Club at 11 & 12 Charles Street, Westminster. 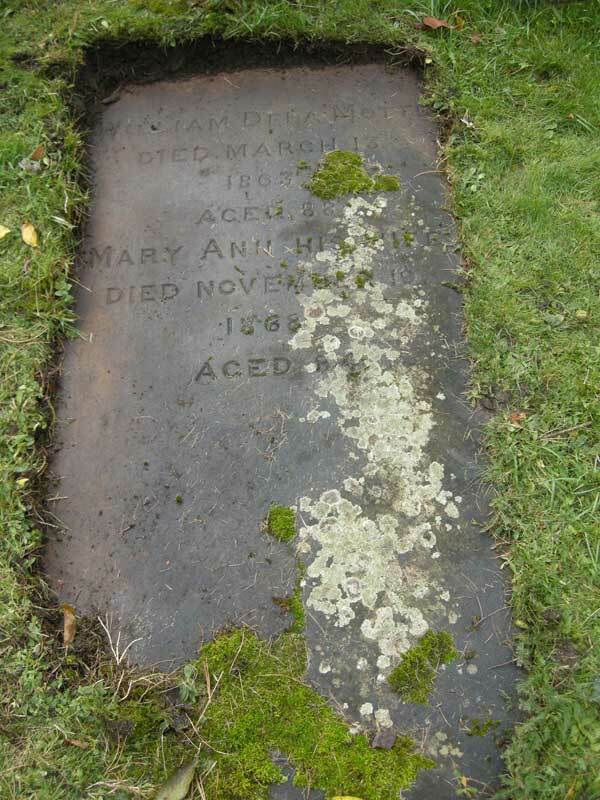 Edward Delamotte died at Camberley on 18 December 1896 at the age of 79 and was buried at Yorktown on 22 December. .
Louisa Delamotte, Mrs William Mayo (born 1820/1) was living in Hornsey with her husband in 1851. Philip Henry Delamotte (born 1821) was an engraver. He and his wife Ellen were living at 46 Broad Street, Oxford when their daughter Bessie Geraldine Delamotte was born in 1847/8: she was baptised at St Mary Magdalen Church on 16 February 1848. By the time her sister Mary Sophia Delamotte was born in early 1850, the family had moved to London, and the 1851 census shows them living at 26 Newton Road, Paddington. 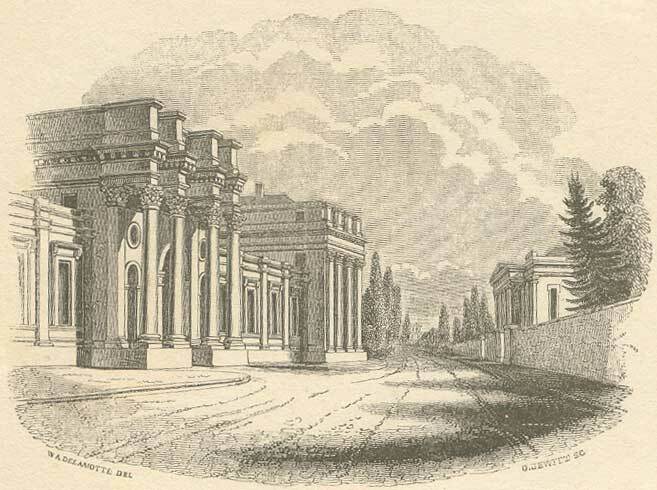 By 1861 Philip Delamotte had been appointed Professor of Drawing at Sandhurst in his father’s place. He and his wife were away at the time of the census that year, but his children were at home at 38 Chepstow Place, Kensington: Bessie (13), Mary (11), Ellen Mary (6), Constance (4), and Digby John (1). In 1871 Philip Delamotte was living at Grosvenor Cottages, Twickenham with his wife and five of their children: Bessie (23), Mary (20), Ellen (16), Constance (13), and Evelyn (7). In 1879 he was appointed professor of fine art at King’s College, London. He died at the age of 67 in the Bromley district (death registered first quarter of 1889). His wealth at death was £2,111 0s. 6d. (More information in his separate entry in the Oxford Dictionary of National Biography, and here in Wikipedia). Geraldine Delamotte, Mrs John Parsons (born 1826/7) was living at The Lawn, Banbury Road in 1851 with her husband John Parsons and their daughters Geraldine (2) and Anne (9 months), and their three servants. By 1861 John Parsons was a wine merchant, and they now had seven children: Geraldine (12), Annie (10), John (8), Wallace (7), Alice (5), Edith (3), and Ruth (1), and six servants. Geraldine’s next daughter Emily Maud Ada Parsons died at the age of 14 weeks in 1863; and in that same year her husband John Parsons also died at the age of 48, and they are buried together in St Sepulchre’s Cemetery: see separate grave. In 1871 Geraldine (41) was living in Hastings with five of her children; and in 1881 she was lodging in Eastbourne with three of her daughters. In 1901 she was living at 20 Waverley Road, Portsmouth with her widowed daughter Ruth Merriman and her grandson Ross Highton; she died there on 22 August 1902 at the age of 76, and her effects came to £280 3s. 11d.